Anger over Anglicanorum coetibus, the Pope’s provision for Anglicans wishing to become Catholics, has gone from erudite articles and civilized public discussion to vandalism, thuggishness and outright hatred. 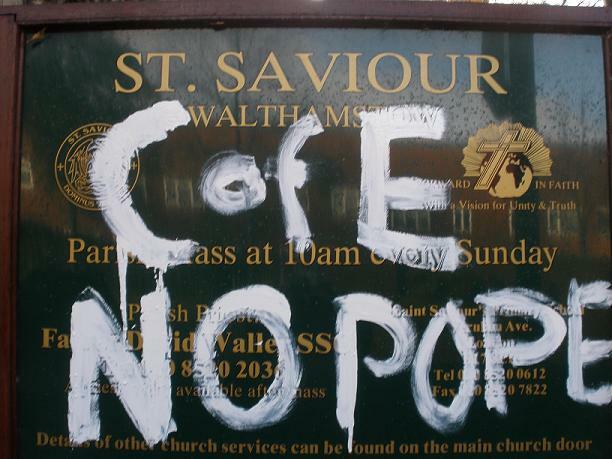 The above is the noticeboard at the Anglo-Catholic parish of Saint Saviour’s Walthamstow, in East London, which was vandalised overnight. According to Fr Edward Tomlinson, the parish priest Fr David Waller woke up to find the noticeboard graffiti-ed. He was also subjected to a threatening message on his answering machine, which said there would be violence if his church took up the personal ordinariate.